These handmade, recycled glass goblets feature offset stems. A distinctive alternative to straight wine glasses, these goblets feature offset stems as graceful as a giraffe's neck. That inspiration may have come from the wildlife that roams the preserves of Swaziland, where these glasses are made. Swazi artisans collect 100% recycled glass and mouth blow, stretch, and shape it into designs that re-imagine the traditional base/stem/bowl relationship. Great conversation starters, they'll add a touch of offbeat originality to everyday entertaining. Crafted by a team of glassblowers in Ngwenya, Swaziland. One of the mountains that encircle the tiny African Kingdom of Swaziland resembles a basking crocodile. At its foot is the remote village of Ngwenya (the Siswati name for crocodile), where a small group of Swazi craftsmen and women blow and hand shape glass with traditional artistry. Each of their creations is handmade from 100% recycled glass, most of it from bottles gathered from all over the countryside. Not only are the people of Swaziland encouraged to collect the bottles, but the artisans also work with local schools to instill a sense of environmental awareness in the children. 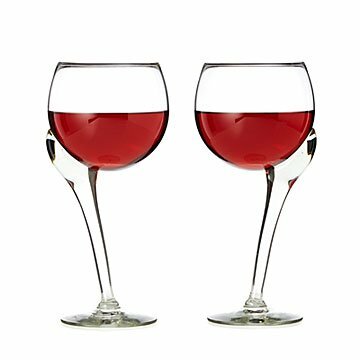 These wine glasses are stunning. The wine glasses are so unique and beautiful. Makes a great gift!